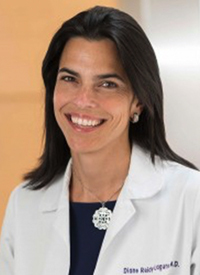 Improved chemotherapy combination regimens are enhancing outcomes for patients across a range of gastrointestinal (GI) cancers, according to Diane Reidy-Lagunes, MD, who reviewed practice-changing findings during a presentation at the 3rd Annual School of Gastrointestinal Oncology™ (SOGO®). Reidy-Lagunes outlined the current state-of-the-art GI care during her presentation at SOGO®, which Physicians’ Education Resource® hosted April 28 in New York City. She detailed findings from pivotal studies in gastric, pancreatic, biliary, and colorectal cancers to give her audience an overview of the field. In the randomized, multicenter, phase III trial, patients with resectable gastric cancer or adenocarcinoma of the gastroesophageal junction type I to III were assigned to FLOT (n = 356) or ECF/ ECX (n = 360). ECF was the previous standard of care based on results from the MAGIC trial, which was published in 2006. Grade 3/4 diarrhea, infections, and neutropenia occurred more frequently in the FLOT arm, but the ECF/ECX arm had higher rates of grade 3/4 vomiting (2% vs 8%) and nausea (7% vs 16%). The 2 groups had nearly identical rates of serious adverse events (AEs), serious AEs related to treatment, and toxic deaths. There was no difference in operative morbidity/mortality between the treatment groups, Reidy-Lagunes added. Furthermore, there were no differences in terms of complications, death at 30 or 90 days, or number of hospitalization days. That does not mean there is no hope for these patients, Reidy-Lagunes said—gemcitabine has been the backbone for both metastatic and adjuvant treatment since the 1990s. The advent of FOLFIRINOX (leucovorin, fluorouracil, irinotecan, and oxaliplatin) gave patients with metastatic disease who had a good performance status a new option, and results published in 2017 did the same in the adjuvant setting. The median OS for gemcitabine alone was 25.5 months (95% CI, 22.7-27.9) versus 28.0 months (95% CI, 23.5-31.5) for the combination (HR, 0.82; 95% CI, 0.68-0.98; P = .032).